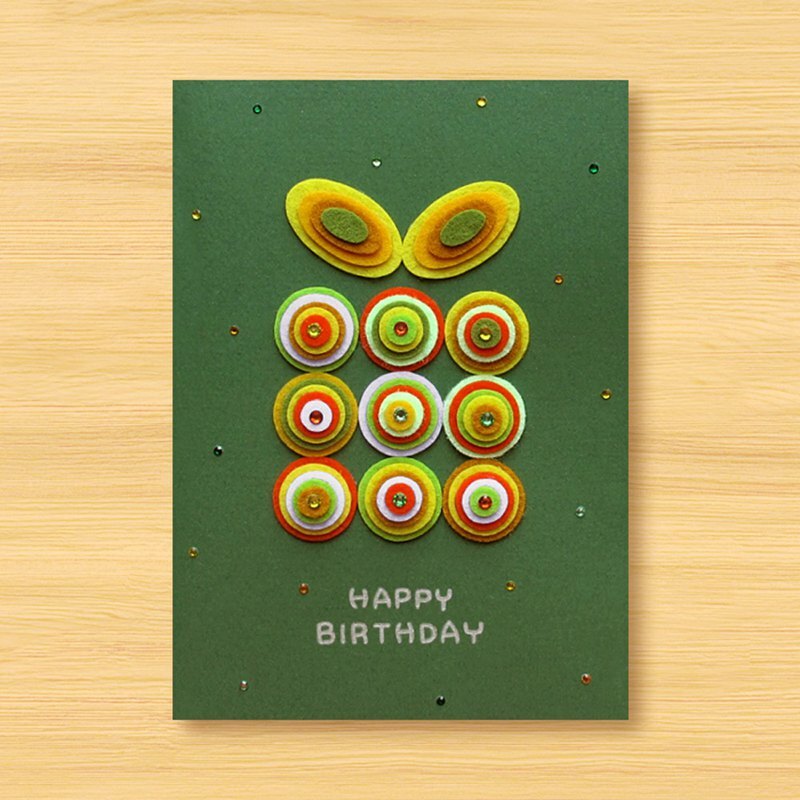 Handmade Card: Cute Circle Birthday Gift Box C (birth card, thank you card, universal card) ■ Size: about 14.5 * 10.3 cm ■ Material: art paper, colored diamonds, painted pens, non-woven fabrics ■ Form: fold in half, turn left and right, write on the right side of the inner page, khaki green card ■ Handmade envelope: light goose yellow envelope ■ Change of cover text: The text can be customized. Please use English characters as the main word. ■ Packing: transparent thick zipper chain bag, foam, cardboard, environmentally friendly packaging love the earth :) [Store Home] https://www.pinkoi.com/store/dddesign Christmas goods: https://www.pinkoi.com/store/dddesign?tag=%E8%81%96%E8%AA%95%E7%AF%80&i18n_tag=%E8%81%96%E8%AA%95%E7%AF%80&page=1 New Year's merchandise: https://www.pinkoi.com/store/dddesign?tag=%E6%96%B0%E5%B9%B4&i18n_tag=%E6%96%B0%E5%B9%B4 Animal goods: https://www.pinkoi.com/store/dddesign?tag=%E5%8B%95%E7%89%A9&i18n_tag=%E5%8B%95%E7%89%A9 Valentine's Day Products: https://www.pinkoi.com/store/dddesign?tag=%E6%83%85%E4%BA%BA%E7%AF%80&i18n_tag=%E6%83%85%E4%BA%BA%E7%AF%80&page=2 Mother's Day merchandise: https://www.pinkoi.com/store/dddesign?tag=%E6%AF%8D%E8%A6%AA%E7%AF%80&i18n_tag=%E6%AF%8D%E8%A6%AA%E7%AF%80 Father's Day merchandise: https://www.pinkoi.com/store/dddesign?tag=%E7%88%B6%E8%A6%AA%E7%AF%80&i18n_tag=%E7%88%B6%E8%A6%AA%E7%AF%80 Christmas Card: https://www.pinkoi.com/store/dddesign?tag=%E8%81%96%E8%AA%95%E5%8D%A1&i18n_tag=%E8%81%96%E8%AA%95%E5%8D%A1 Birthday card: https://www.pinkoi.com/store/dddesign?tag=%E7%94%9F%E6%97%A5%E5%8D%A1&i18n_tag=%E7%94%9F%E6%97%A5%E5%8D%A1 Valentine Card: https://www.pinkoi.com/store/dddesign?tag=%E6%83%85%E4%BA%BA%E5%8D%A1&i18n_tag=%E6%83%85%E4%BA%BA%E5%8D%A1 Mother Card: https://www.pinkoi.com/store/dddesign?tag=%E6%AF%8D%E8%A6%AA%E5%8D%A1&i18n_tag=%E6%AF%8D%E8%A6%AA%E5%8D%A1 Father Card: https://www.pinkoi.com/store/dddesign?tag=%E7%88%B6%E8%A6%AA%E5%8D%A1&i18n_tag Animal Card: https://www.pinkoi.com/store/dddesign?tag=%E5%8B%95%E7%89%A9%E5%8D%A1&i18n_tag=%E5%8B%95%E7%89%A9%E5%8D%A1 Character Card: https://www.pinkoi.com/store/dddesign?tag=%E4%BA%BA%E7%89%A9%E5%8D%A1&i18n_tag=%E4%BA%BA%E7%89%A9%E5%8D%A1 Sticker card: https://www.pinkoi.com/store/dddesign?tag=%E8%B2%BC%E9%91%BD%E5%8D%A1&i18n_tag=%E8%B2%BC%E9%91%BD%E5%8D%A1 Graduation Card: https://www.pinkoi.com/store/dddesign?tag=%E7%95%A2%E6%A5%AD%E5%8D%A1&i18n_tag=%E7%95%A2%E6%A5%AD%E5%8D%A1 Teacher Card: https://www.pinkoi.com/store/dddesign?tag=%E6%95%99%E5%B8%AB%E5%8D%A1&i18n_tag=%E6%95%99%E5%B8%AB%E5%8D%A1 Luminous card: https://www.pinkoi.com/store/dddesign?tag=%E5%A4%9C%E5%85%89%E5%8D%A1&i18n_tag=%E5%A4%9C%E5%85%89%E5%8D%A1 Shake card: https://www.pinkoi.com/store/dddesign?tag=%E6%90%96%E6%90%96%E5%8D%A1&i18n_tag=%E6%90%96%E6%90%96%E5%8D%A1 Wedding Greeting Card: https://www.pinkoi.com/store/dddesign?tag=%E5%A9%9A%E7%A6%AE%E8%B3%80%E5%8D%A1&i18n_tag=%E5%A9%9A%E7%A6%AE%E8%B3%80%E5%8D%A1 Key ring: https://www.pinkoi.com/store/dddesign?tag=%E9%91%B0%E5%8C%99%E5%9C%88&i18n_tag=%E9%91%B0%E5%8C%99%E5%9C%88 Postcard: https://www.pinkoi.com/store/dddesign?tag=%E6%98%8E%E4%BF%A1%E7%89%87&i18n_tag=%E6%98%8E%E4%BF%A1%E7%89%87 .